Milton Keynes Hospital entered into a partnership with the University of Buckingham to become a University Teaching Hospital. As a University Hospital, this allows us to attract, train and retain the best doctors and contribute towards the financial stability of the organisation. The partnership also includes the development of a state-of-the-art Academic Centre on the hospital site. As a result of this partnership, the trust changed its name to Milton Keynes University Hospital NHS Foundation Trust on 2 April 2015. This partnership will expand our current clinical teaching to include medical students from the University. The first set of 70 students started their studies in Buckingham in January 2015, and since then over 250 students have worked in clinical placements across the hospital. For patients – we have medical students on-site who will be interacting with patients, performing examinations, and observing while patients have tests, procedures or operations. If you do not wish for students to be involved in your care please inform your doctor or nurse. For staff – the development of the Academic Centre and Medical School will support our development of research and education, creating many more exciting opportunities. 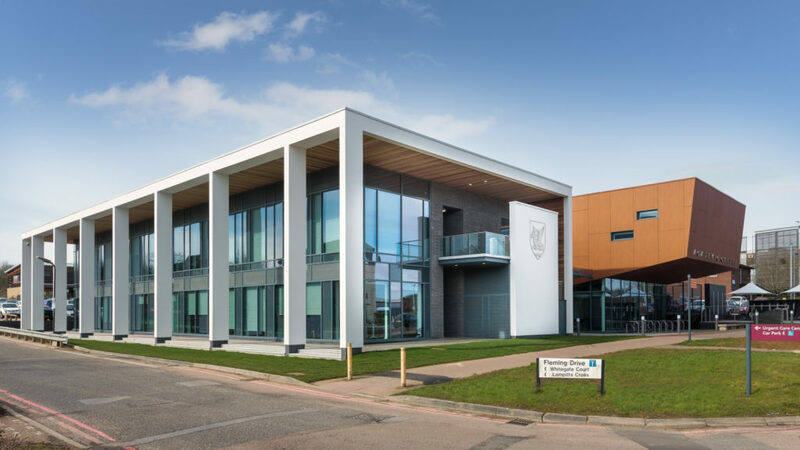 An Academic Centre containing a medical school building (funded by the University of Buckingham) was opened on the hospital site in February 2018 by HRH the Duke of Kent. The facility includes a simulation operating theatre, classrooms to stream live operations and a 200 seat lecture theatre. To celebrate the start of construction of the Academic Centre, MKUH and University of Buckingham sealed a joint Time Capsule containing messages and objects from staff and students for future generations to open in 100 year’s time. The contents of the capsule came from ideas from staff across the hospital including an envelope signed ‘with love’ from the hospital’s post room, a midwife’s ‘Trumpet’ stethoscope invented in the 18th century and a photograph of a baby born in the hospital on the day the capsule was sealed.